The story is a common one across the Old American West. A thriving town, complete with saloons, banks and hotels, experiences unprecedented growth. Then one day, the economic sources dry up, and the town is soon deserted. Evidence of “ghost towns” with stories like these are present throughout Nevada as well as neighboring Arizona and California. Most are former boomtowns resulting from mining or speculation during the 1800s. While their glory days are firmly in the past, some of these ghost towns have re-emerged as historical attractions. Several ghost towns are within a two-hour drive from Las Vegas. For those who like to explore the desert, these sites make excellent day trips. The story: Founded in 1906, Rhyolite was named after a type of volcanic rock. However, the town made its fortune from mining gold and ore. As part of the Bullfrog Mining District, Rhyolite's prospects were strong enough to entice industrialist Charles Schwab into investing. 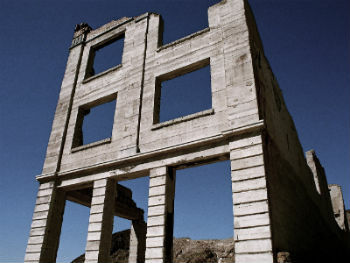 Rhyolite's population swelled to 5,000 by 1908, making it Nevada's third largest city. But when investors determined the mines to be overvalued, Rhyolite went bust. Today: By 1920, Rhyolite's population shrunk to 12 and its infrastructure was deserted. This desolation continues to attract movie producers, tourists and those curious in the Old West. The Bureau of Land Management runs historic Rhyolite, which is just 4 miles west of Beatty. Guests will find remnants of the an old bank, school house, caboose and an outdoor sculpture park. The story: Oatman's boom began in 1915 when a pair of prospectors struck gold in the nearby Black Mountains. The find netted $10 million, leading the town's population to hit over 3,500 within a year. By 1921 Oatman's mines were nearly milked dry of gold. A fire destroyed several smaller buildings in town. Fortunately, the Hotel Oatman, built in 1902, was spared. Today: When the Oatman portion of Route 66 was relocated north through Kingman in the 1950s, the town was mostly abandoned. 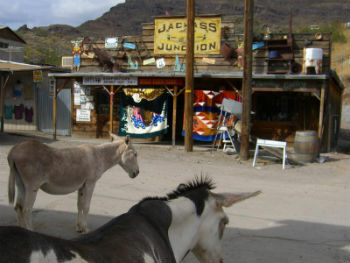 However, recent interest along with gaming in nearby Laughlin, NV has made Oatman one of the most popular American ghost towns. Wild burros (descendants of those brought to the town by miners) roam freely through the streets. Staged gunfights and other events are held on most summer weekends. The story: Calico's glory years in 1880 were short lived. Formed in 1881, Calico became California's largest silver mining camp by 1896. The town's 500 mines produced $20 million worth of silver ore within 12 years. With its population soaring to 3,500, Calico had newspapers, a school district, hotels, brothels and more. Unfortunately, the price of silver went down in the late 1890s, leading the town to be abandoned by 1907. Today: Walter Knott, creator of the Knott's Berry Farm theme park, recognized the potential of Calico and purchased the town in 1951. He had Calico restored to its original Old West condition, and began turning it into an attraction. In 1966, Knott donated Calico to the county regional park service. It now attracts hundreds of visitors, with its shops, diners, camping and more. The story: Situated deep within the Eldorado Canyon, Nelson’s history dates back to 1775 when Spanish explorers found gold in the area. A century later, American prospectors formed the notorious Techatticup Mine in the canyon. During this period, lawlessness and shootings were rampant. The name “Nelson” comes from a miner who was murdered in 1897. Today: Nelson now looks more like a movie set, several films were shot here. While several old mines and buildings still stand, they have been supplemented with other vintage items, like an old school bus, gas station and airplane wreckage. With these maintained set pieces, Nelson is especially popular with photographers. Expect to see engagement sessions and other photo shoots most days. 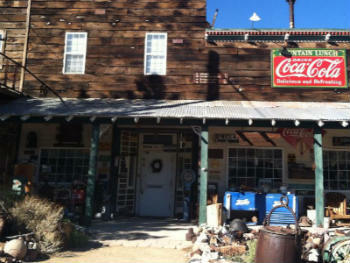 The story: Goodsprings takes its "ghost" town status to another level. 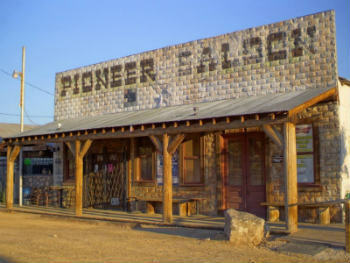 The town's central landmark, the Pioneer Saloon, has been the site of numerous shootings over its 90 years of existence. Residents say it remains haunted by old gun fighters. Today: The Pioneer Saloon is Nevada's oldest operating bar and continues to serve patrons and host parties. The inside features memorials to Lombard and husband/fellow actor Clark Gable. The town maintains a small population that is served by the Goodsprings Schoolhouse, which has stood since 1913. "Ghost tours" and "star journeys" for astronomy enthusiasts are periodically held in the town as well. The story: Unlike most Old West ghost towns, St. Thomas was never a mining center. The town was founded by Mormon settlers in 1865 and served local farmers. In 1871, St. Thomas was claimed by Nevada (it was previously claimed by Arizona). Rather than pay back taxes to the state, the settlers left town. St. Thomas was completely abandoned in 1938 when Hoover Dam construction led to Lake Mead completely covering the area. Today: The plundering levels of Lake Mead has given this underwater ghost town new life in the 21st century. As the water levels have gone down due to drought, the ruins of St. Thomas became visible about 10 miles south of Overton. The site is now maintained by the Lake Mead National Recreation Area and makes an excellent side trip for those visiting nearby Valley of Fire. The story: Lots of different metals were mined from the hills of Chloride, but silver was what what made it a boomtown in the early 1900s. Population reached 2,000, and there was even a Santa Fe Railroad Station in the town. However, population steadily decreased in the 1940s, as World Ward II made energy prices for extracting ore too expensive. Today: With over 300 residents, Chloride is considered a ghost town that never really died. There is plenty of evidence of the old days, with several historical wooden structures still standing. These include the old railroad station. There's also a modern studio/art gallery, restaurant, mock gun fights and old mine tours. Located of US-93, Chloride makes an excellent side trip for those headed to the Grand Canyon or Oatman, AZ. The story: As its name indicates, Goldfield's birth lay in the discovery of gold in nearby mines. From its founding in 1902 through 1940, Goldfield produced a whopping $86 million in gold. The town even survived a fire that destroyed several wood buildings. At its peak, Goldfield was home to 20,000 residents, including Wyatt and brother Virgil Earp. In 1906, the town hosted the lightweight boxing championship. Today: Many of Goldfield's historic old buildings remain standing with private owners. Guests can tour the old high school, Goldfield Hotel and county courthouse. 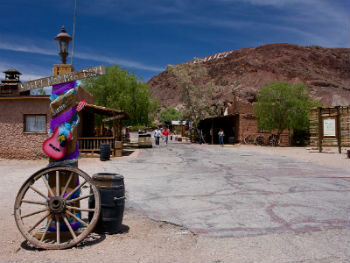 With increased tourism and interest in the town's history, Goldfield can be considered a semi-ghost town. A hotel, general store and diner serves the area. A parade celebrating the town's history is held in August.